Sometimes we know in advance if our dog will lose sight and/or hearing. I have a senior dog now who is mostly deaf from age. So far his sight seems OK, but I know it too may begin to fade. There are some things we can do to help ease this transition for our dogs. One is to teach hand signals to our dogs for basic every day behaviors (sit, lie down, wait at the door, come) and for some of the fun tricks they know (fetch, shake hands, spin, etc). It's fairly easy to teach dogs hand signals. If you've originally taught your dog the behavior with a food lure, often the hand movement you use can become a hand signal for the behavior even when you're no longer using food to elicit the behavior. For example, many people raise their hand up when teaching a dog to sit - this same raising up of the hand can become the hand signal. If you practice with the hand signal and reward often, your dog will respond just as easily to the hand signal. Think of behaviors you ask of your dog throughout the day, and perhaps you are already using a hand gesture (signal) that you can continue using. Sometimes use just the signal and see if your dog responds without your verbal input. If not, you can remind with the verbal at first. The sequence would be - signal - pause just long enough to see if your dog will respond - verbal to remind if needed - reward. It's important as your dog loses hearing to be animated with your praise - use petting, use play, always use a happy face, clap your hands. If your dog was once hearing, praise will be important and the tone of your voice gives him cues. You can begin now while he has hearing, to add these things - clapping your hands, smiling, acting happy in your body language - to your verbal praise so he begins to associate them together. Dogs really tune into our body language. But by teaching this when your dog can still hear, you will associate those body motions with all the lovely verbal praise that he's already learned to love. As dogs lose their hearing, they begin to sleep heavier and will often wake up with a startle. Startling is a normal behavior and you may never get rid of it totally, but a dog that can hear will be woken up gradually by sounds in its environment which its brain will recognize. As the hearing begins to fade away, noises may not sound the same and his brain may not be able to recognize what they are, or he may not hear the noises at all. So when you do wake him up, or he gets bumped, he will jump up and be scared until he realizes where he is and who is with him. It's easy to help with this and you can play these games from the time your dog is a puppy, but I find it is important to revisit them as your dog becomes a senior or when you first notice his hearing may be fading. Do lots of trading touch for treats. You touch him, he gets a wonderful treat. Do it a lot just as a fun game. Do it when he is awake and paying attention at first. Then do it while he is awake but perhaps not paying attention, so you surprise him a bit. And lastly, do it every once in a while when he's asleep. It's courteous to allow him to sleep without interruption, but sometimes there is a reason you will need to wake him up - be ready and give several special treats as soon as you wake him up. Help him associate being startled with something good, so he won't wake up fearful, he will wake up and look forward to the good treats that are to come. If your dog is losing his eye sight, begin to teach him cues that will help him navigate his environment and stay safe. If he can hear, use verbal cues to help him learn to stop, wait, to go up or down a step or curb, etc. Help him. Guide him gently so he learns new ways of navigating around the house and yard. You may want to put a small bell on your wrist or ankle when you go for a walk so your dog can keep track of where you are and whether you're moving or not. Of course, you can also talk to or sing to him so he has a voice to follow. Try to empower him and teach him problem solving as often as possible. Teach him new ways to play with you that you both enjoy. Think of how much he relies on the vision he does have during his daily activities. Are there things you can do to help him get around safely? Gates at the top and bottom of steps or drop offs are easy to implement. 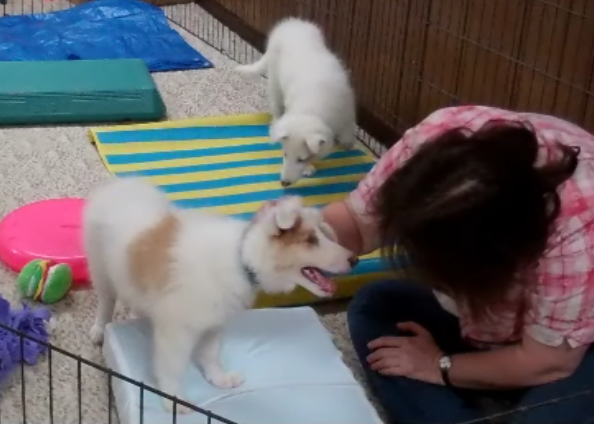 Blind dogs can maneuver steps, but they should be supervised, especially in the beginning. You will learn to watch out for obstacles that you don't normally think about steering your dog around - fire hydrants, trees, branches on a bush, curbs, etc. There are tools that can help a blind dog to navigate. If you are thinking of using a halo harness, or eye protection, begin to condition your dog to them now, making sure you are creating a positive association and that you are both having fun. It can be a scary transition for a dog to lose its sight. Plunking a lot of new, weird equipment on your dog at this time can cause him to shut down and be more fearful. Take it slowly. When a dog in a multiple dog family loses its sight, there may be a period of adjustment among the dogs. The blind dog may bump into other dogs or overstep their bounds into another dog's space - something he would not have done before because he could see to judge distance, could see the other dogs, and could respond to their communications. Now, he may find himself getting into trouble, as the other dogs may see him as rude stepping into their space. Be prepared to supervise and to change the way you all interact for awhile. If there is any tension, don't leave a blind dog unsupervised with the other dogs, even if they have been left alone for years. Separate or supervise. At least until you're sure everyone has adjusted. At some point, your dog may lose both its sight and hearing. 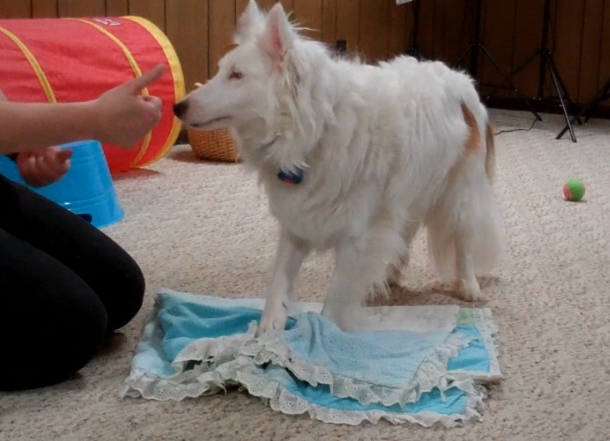 Begin to teach touch cues for things that you communicate to your dog every day. A touch cue doesn't need to be complicated. Touching a dog under the chin can mean, come forward, let's go. Putting a harness on will become a touch cue that you are going outside for potty or a walk. Develop a language through touch. Loving touch is very important just to show your dog how special he is. We all crave touch and it is very important to a dog that is blind and deaf to continue to have special loving touch daily. Most important of all, perhaps, is to realize that you will be sad when you realize your dog is losing sight or hearing. This is normal and natural. It's OK to be sad and to grieve. You and your dog will both go through a transition period. Please be kind to yourself during this time, and have patience with your dog. Help him and guide him. Take time to help him enjoy things that he's always enjoyed - sharing an ice cream cone, hanging out on the deck in the sun, going for a car ride, etc. Together you will both start to realize a new reality that is not worse than before, but is just different than before.